Plyometrics is the method of training which enhances explosive physical reaction through powerful muscular contractions resulting from rapid eccentric contractions. 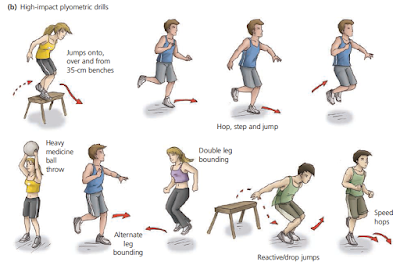 These muscular contractions are achieved mainly through a variety of jumping, bounding and hopping exercises. This training relies on basic equipment such as steps, hurdles, medicine balls and jump ropes. Whatever plyometric exercise you utilize, the underlying mechanism becomes the sretch shortening cycle: in each exercise, the muscle is rapidly stretched (or "loaded") before it is contracted. So plyometrics essentially builds elastic strength: a concentric contraction (muscle shortening) needs to occur immediately following an eccentric contraction (muscle lengthening) in order to achieve the desired dramatic increase in force. When muscle stretches in this manner, its elastic components store some of the energy and make it available during a rapid subsequent contraction. The X-box jump. - difficult but effective. Similar to regular side box jumps, this exercise also requires an individual to jump off the front and back of the box in addition to the sides. Do not attempt the X-box jump until totally comfortable with regular side box jumps. The square cone drill. The athlete navigates four cones placed approximately 10 yards apart in a square with exercises such as side shuffles, backpedal and high knee runs, continuing for a set number of reps or a time period. Speed and agility should be the emphasis of this exercise. Any session should take place a surface such as the grass in the outdoors or rubberized flooring indoors. Avoid concrete and wood. Before any session, warm up--a five minute walk, calisthenics or low intensity hopping and jumping to elevate your core body temperature. 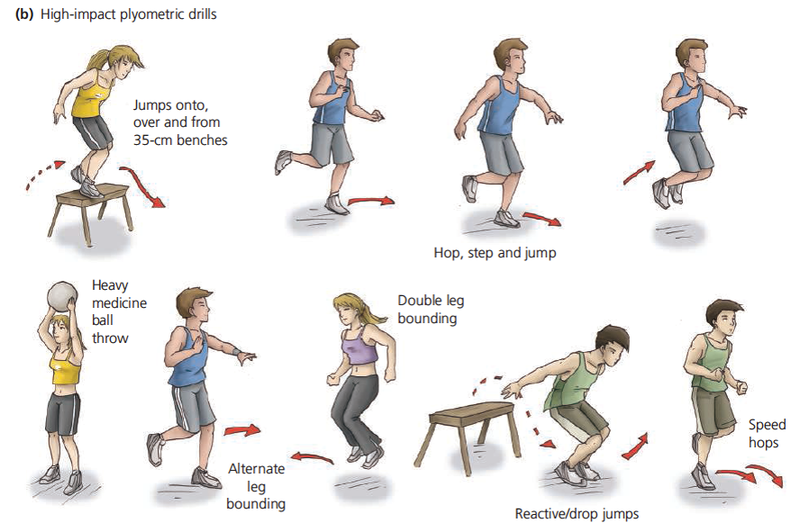 Perform the more complex plyometrics first since these require more energy, muscle synergy and concentration. “I always advise beginners to take their time and concentrate on form, not intensity,” Mark concludes: “It’s almost like learning to walk again, it can be very awkward doing some of these exercises, but the body soon adapts."